No matter how many t-shirts I get, I always have a favorite. The favorite isn’t a single shirt though. It’s a rotating spot. The #1 shirt is always in danger of being dethroned by a new contender. In practice though, the reigning #1 usually stays on top for a few years at a time. Being the favorite is a curse. Most #1 shirts loose their place because they are worn out not because a new shirt came along that deserved the top spot. I totally have a favorite shirt right now. Meh, I have two methods of deciding which shirt I wear. Which method I use depends on whether or not I’ve decided to actually put my clothes away. If I do put them on their hangers, they get worn in the order they went up, which is however they came out of the basket. The other method is just grabbing one at random from the basket itself. That’s not to say I don’t have favorite shirts, it’s just that the days I do get to wear them are extra special because it’s so random. Heh. I just bought seven identical sets of clothing in one go. I don’t usually have a favorite shirt, shoes on the other hand. I have a pair of blue suede tennis shoes from way back in highschool that have survived bad weather, over use, the drawing-on-your-shoes stage and my mother’s wrath. They’re in my closet right now and I still wear them. Either…internet meme week or…t-shirt week. Biff should beware of geologists with core-boring machines! RUN from the strata samplers! My shirt-picking algorythm is very basic. What comes to hand first? Is it clean? End loop. I really wasn’t all that into Vegetable week or plant week or whatever it was; some of the comics were kind of clever but never Biff-level-funny. I was worried for a bit, but goddamn Chris, this one is HILARIOUS. Thank you so much for the laughs, I’ll never doubt you again! My favorite shirt used to be a simple,black,XXL size t-shirt.Then I bought a shirt that was exactly the same but had the Linkin Park logo on it.THAT’S my currect favorite.As for shoes,my favorites are a pair of light gray,gray,dark gray and black sneakers .It also has some orange in the inside. @stephan– I now have this fantasy that if I ever move somewhere I will have like…twelve identical outfits and hang them all in my closet (hiding all my normal clothes). Like a cartoon character! And then I bide my time until someone gets mad at me and asks if I EVER wash my shirt/pants so I can give them a blank look–“These aren’t the same clothes I wore yesterday.”–and then when they argue I show them my closet. But…wouldn’t he then have to wash them all? I think the only ones that he would have to wash would be the one on the very outside and on the one touching his skin. The rest are fine. 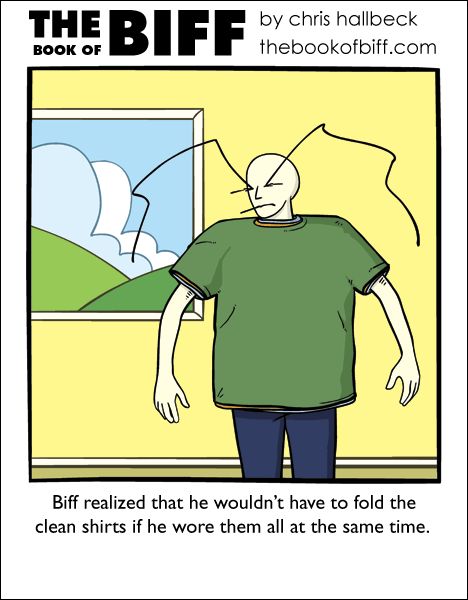 works to keep shirts neatly pressed. but i usually pick my shirts by: what ever i pick up; do i like it; is it a different color than my pants;am i doing anything today, or should i save it for tommarow? Meme week! Meme week! Meme week! @Alex G: That T-shirt is so full of win! That’s one of my favorite songs! Biff must be very warm. Oh wow, I should’ve thought of that. My favourite shirts are ones with prints. So usually my problem with choosing a T-shirt for the day is more like choosing a picture to wear for the day.. And now my closet is full of T-shirts with cool prints that I never find the time to wear; it’s a kind of a collection here. So I never get to have a favourite. D: I’ts kinda sad, really. @ comic: This is impressively random. @ post-thingy: I had a favorite shirt for awhile. There was an angel flying on the front of it. I liked the darn thing so much that I wore it out, but before I did that, I scanned the image into my computer, altered it a bit, and I now use it for any and all online avatars that I care about enough to go to all the trouble to retrieve it from where I keep it. I recently made a line-drawing that traced over it. When I get that onto a t-shirt, that will become my new favorite. If someone were to make that shirt for me, I would be all over him/her/it/them/snizzletoot. I call clothing week, laundry week, or something like that.